I got a Acebeam X80 for fun, but it has turned into my goto light now since even the low setting is usually enough. I tested how long it will stay in "ultra" mode (5mins @ 162°F) and gets uncomfortably hot to hold. Not sure why one battery was hotter than the others, but they were a mixed batch in the video.. It gets even hotter, quicker in a humid summer night. The UV is cool too. I might have to get some outdoor shots sometime. Their build quality is excellent as well-----enjoy it. Thanks! My crypto crap is finally paying off. So I can get the lasers and flashlights Ive always wanted. 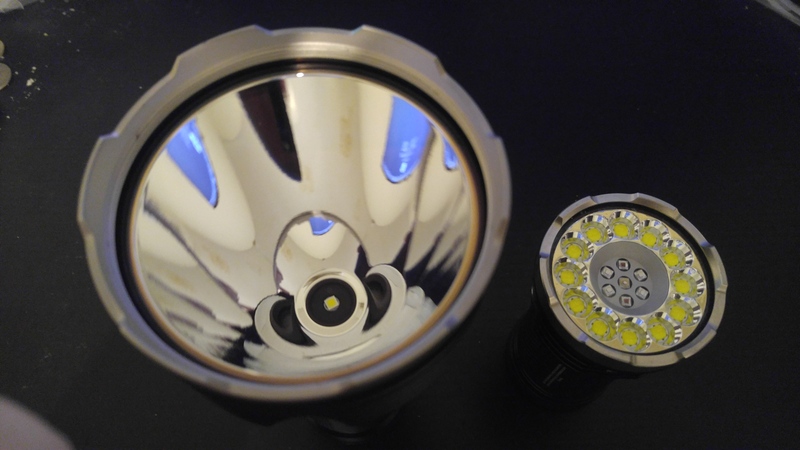 I’m looking into the K65 Since my Thrunite TN40 doesn’t do it for me anymore lol! 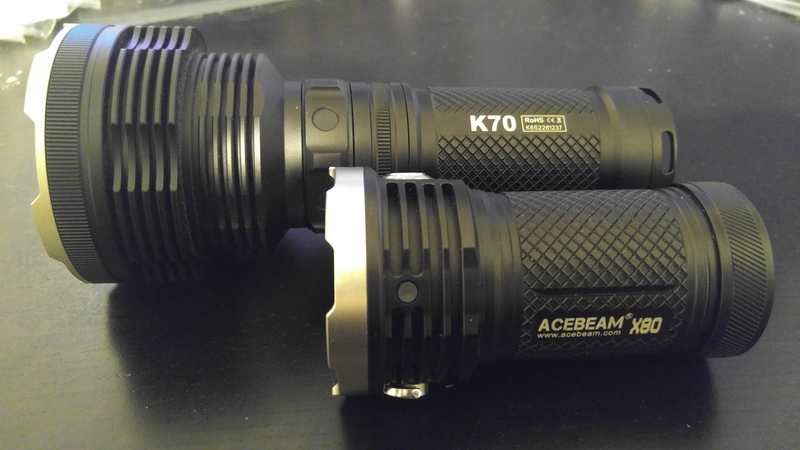 Man, That Acebeam looks pretty good. I do like the number and variety of LEDs used in it. I would consider getting one, but flashlights aren't my thing. + Rep. Confused about the batteries. Are they not all the same? Not a good sign if they are not all discharging together. I would purchase all new cells such as Samsung 25r. I had a battery issue with a 4 cell flashlight once when I first got it and upon inspection found that one of the springs was compressed more than the other 3 for some reason so it didn't make proper contact. Don't think that's your issue though. Looks like you are mixing cells which you should never do. They will draw from each other. Man that thing looks nasty bright How much for that beast? This is what caught my eye, that's one hell of a nice stout battery holder, look at how thick those nice springs are, nice. It's what caught my eye too except I was looking at the mismatched batteries. Took a guess that he is using them especially as he mentioned a battery issue. Why I recommended 4 new Samsung 25r as they won't mind the load a although he could go with whatever the good 3100mAh range pan or Sanyo cells are. All cells should be drawing down together. It is new. Those happened to be the cells laying around that were charged at the moment (I have access to a lot of old laptop batteries :evil: so I get tempted to use them sometimes). I might have to do it again with the "acebeam" protected batteries that it came with. The battery thermal test did scare me away enough to stop mixing them with high drain stuff. Ya its great for burning your hands on turbo but I still like it. I was playing with the K70 a few days ago with that lens from a TV I dug up, and was burning stuff with it. Decided to upload a clip of it. I got a K60 too but it cant keep a tight beam like the K70. 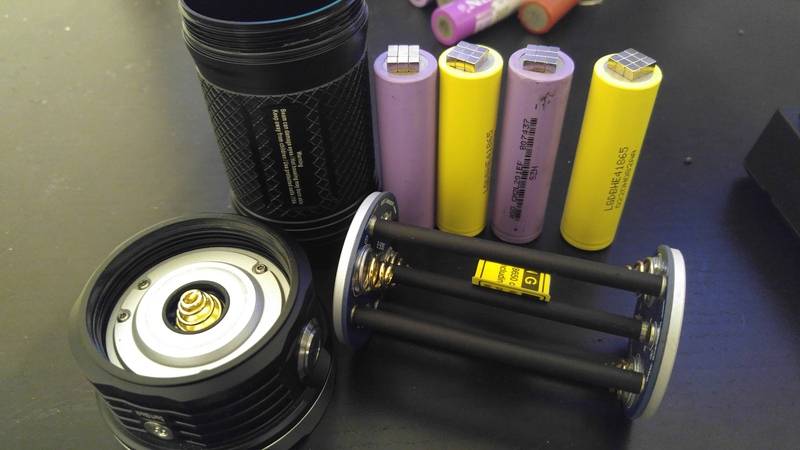 May I suggest www.liionwholesale.com for batteries. They have the best prices on new batteries that I have been able to find anywhere. I got some new Panasonic 3400 mAh 5 amp protected cells and they were under $7.00 each. I put them on my Opus BT-C3100 intelligent charger and checked the capacity and the internal resistance. They were both over 3000 mAh and under 100 mOhms. Dayyyyum! Those are almost too cheap.